I was quite thankful for receiving a Live at Leeds booklet on Record Store Day this year, as I had hoped this would allow me to have a plan in place ahead of time. However due to the vast amount of talent on show, my mind kept flickering from one band to another. Grumbles aside, I entered the venue part way through the first song. Having heard a few songs by the band prior to Live at Leeds and watched their video for ‘Don’t Give Up’, I was desperately hoping to discover they were as strong in a live performance. They definitely were. It’s hard playing in a venue so early on. Especially one that is effectively a student hall, complete with curtains drawn across the windows failing at the sun occasionally breaking though the gaps. 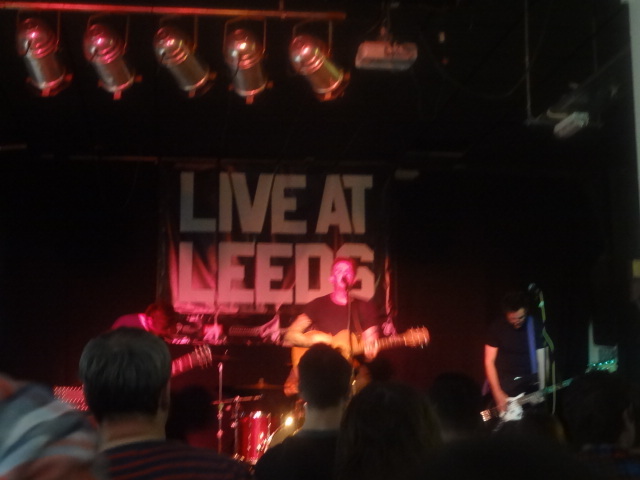 Apologies about the image quality – Leeds Met is never kind to cameras! Impressively engaging the crowd to clap along throughout, the melodic crashing of drums against guitar riffs; almost Biffy Clyro going head-to-head with You Me At Six combined with the likes of Thrice is evident. But then this band can also strip back their sound to showcase their emotive vocals and lyrics. It’s such a lot to pack into a short 30 minute set that it seems a shame that it has to finish when it does. Supporting Sons and Lovers at Belgrave Music Hall in just over a week, I can’t help thinking a mid-to-late afternoon gig at Nation of Shopkeepers or even The Cockpit would have been ideal for this band. I expect it won’t be too long until this opportunity is thrown their way.